If it takes a village to raise a child, it takes an ecosystem to grow a startup. Xact Metal is proof. The company is basking in the excitement of two recent milestones: shipping its first batch of products and welcoming a global distributor network, eager to sell even more. 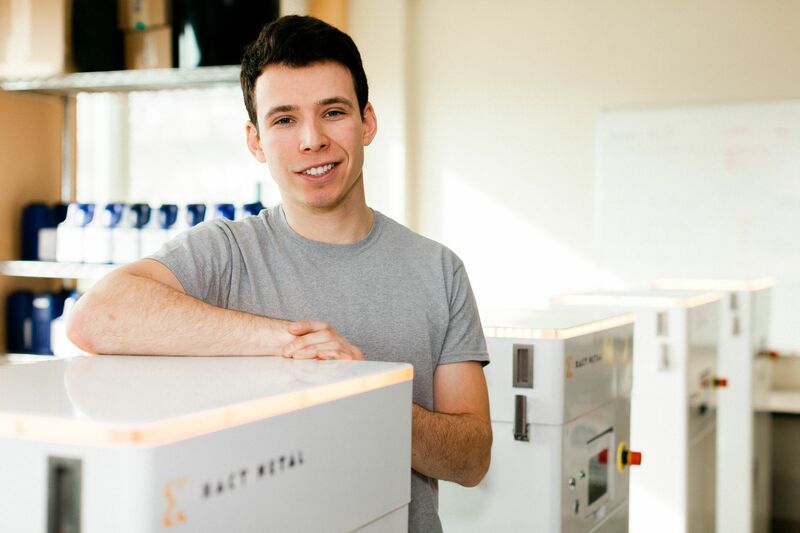 Since taking space over two years ago in the Technology Center Incubator at Innovation Park, Xact Metal has more than quadrupled its office and maker space, and taken its products from prototype to reality under the leadership of Co-founders Matt Woods and Juan Mario Gomez. But don’t expect them to take all the credit. Support from this ecosystem has arrived in many forms, from critical funding to additional space to casual introductions that have turned into paying customers and new suppliers. All of this assistance has contributed to fulfilling the Xact Metal mission to bring accessible, high-performing 3D metal printing to an array of global markets that are more than ready for it, like higher education, automotive, healthcare, aerospace, engineering and defense. The company’s flagship product, the XM200C, was made specifically to fill a gaping need in 3D metal printing: affordability and usability that don’t sacrifice performance. The machine costs less than half of other available machines and is half the size, with the ability to print larger parts, making it ideal for customers who need 3D metal printing for prototyping, tooling and education. The product line also includes the XM200S, which delivers higher speed printing, and the XM300C, which offers an expanded print area for larger industrial printing needs. In January, Woods and Gomez, along with staff and a few of those ecosystem helpers celebrated the first shipment of XM200C units. Five machines left Innovation Park for delivery to customers across North America. More orders are being filled now, including machines for international shipments to Mexico, Canada and Saudi Arabia. It’s not just the company itself that’s grown out of local investment and resources. Xact Metal’s product line is also locally and regionally made. Several parts are made in Pennsylvania, as nearby as Centre County, York and Ephrata, and final assembly takes place in its incubator space in Innovation Park. Next up for Xact Metal is a push to scale and produce hundreds of machines per year. This stage in its development will prove critical to fulfilling a growing pipeline of orders from distributors across North America, Europe and Asia and beyond. A recent sale training session in State College drew more than two dozen key distributors who are partnering with Xact Metal to bring metal 3D metal printing to more and more people.